After reading this, I decided it sounded easy enough to give it a shot myself. 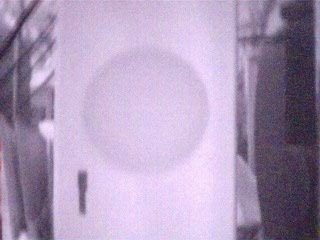 Basically it involves replacing the lense in your webcam with film negative, to give you an infrared webcam. I have some IBM webcam which I never use for anything, so it wasn't a huge deal if I messed it up. I dug it out of hiding and opened it all up, finding that the lense screwed out fairly easily, and that it was constructed better than the one the guy in the article had, requiring me to use no sort of wire or anything to try and hold the film down, since it already had a plastic piece and a clear lense just for that. As can be expected, one can see the light coming from a remote control rawther well. Somewhat more interesting however is that this light seems to act just like an infrared flashlight. I was lighting up parts of my room just by pointing a remote at it. This here is a drivers license. Obviously they use special ink, making it appear blank, aside from the light-colored logos, which only appear as faint circles on there. 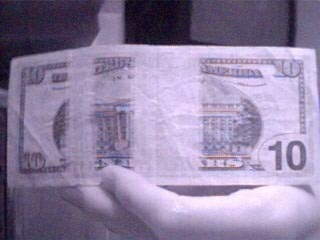 There's some craziness going on with the monies, as can be seen by those gaps. They're perfectly fine when looking at them with the naked eye. I'm thinking this is what change and drink machines use to determine what type of bill it is, based on the gaps in the ink when viewed in IR. Lastly, as an example of how you can see through certain types of material, this is my center channel speaker. It's as if the cloth mesh over the top of it isn't even there, since you can't normally see that speaker hole by looking at it. That's all the truly interesting things I've discovered so far, aside from things the guy showed in the original article. 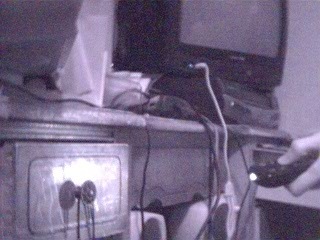 Cool, I didn't know you could do so much with the camera viewing IR. Mostly I just a-used it to check if my remote's batteries were still workin without popping them out. Lloyd: Fare well, Legault. My old friend. Legault: I'll see you again, Lloyd. With Linus... And Uhai... Even if it won't be in this world. Ey, this is pretty cool! I hooked mine up, and it picks up light from my remote. My webcam is a bit different, though. 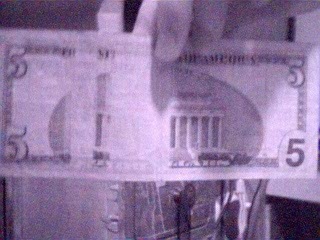 I could not take out the lens or anything, so I just put the negative in front. It looks a bit different, but it does the same thing more or less. Could you take some pictures of something that's clear in infa red, like an empty cell phone case, in front of some other objects? Because you would think that even if infa red waves can pass through it, it would refract it like glass or diamond. What with cell phones being denser than air and all. I somewhat recently tried to return that webcam to normal, I forgot why, but now the lense seems to be loose, leaving it horribly blurry as soon as you tilt it slightly. -o-;; But maybe I can at least make it infrared again, since those film pieces made that section fatter, possibly enough to hold the lense in place again. If so I'll check out some cell phone cases. 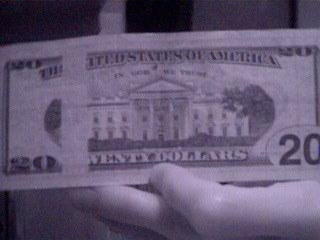 That's pretty coll. One of these days I'll get one of dem webcams and try this. Ten years to the minute, no longer in it. This guy down in Arizona showed me and some other people a pretty cool trick. You take an ice cube and clutch it tightly until it starts dripping cold water everywhere. 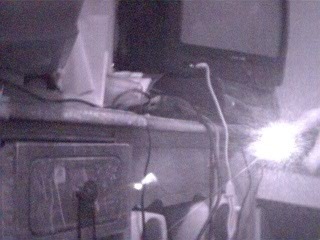 Then, you splash some on your shirt and tale a look at it with the IR camera. The cold water makes it look like you broke a pen on your shirt. He also showed us a video taken with IR camera of a truck pulling up at a store on a hot day. After the guys unloaded the truck, it pulled away, and the colder part made by its shadow remained on the asphault. Careful, or the mice will rise up. Soon Predators and other aliens will adapt to this technology... BE CAREFULL WHAT YOU PLAY WITH!!! Also, I STILL want an X-Ram cam. One day, when the zombies rise and destroy humanity; I will survive, I will live on, I will take your best stuff for myself. I LIVE AGAIN! When was my last post any way? 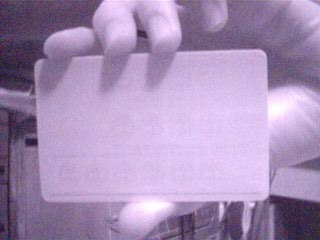 I think I migta messed up the webcam by exposing the CCD to too much light the times I had it open. When I removed the film negative and put the cam back together normal, I get these small color blotches now in the picture. It can still be used, it's just that the image isn't as nice as it once was.